The Tektronix MTS300 MPEG Test System is a high-performance MPEG protocol diagnostic and analysis tool giving you innovative solutions to meet the challenges of designing, verifying and characterizing products and systems using MPEG-2 technology. The MTS300 offers powerful acquisition and computational capabilities for analyzing designs based on MPEG, DVB, ATSC and ISDB standards. These flexible and expandable capabilities include real-time monitoring, data rate analysis and Tektronix-exclusive timing analysis to help diagnose the most challenging problems and characterize real-time performance. In-depth, deferred-time (off-line) analysis helps fully verify compliance to standards and diagnose problems in complex transport streams. Easy-to-use transport stream capture, playout and on-line storage let you build extensive suites of test streams and use these streams to exercise your designs. Additional stream editing capability, with error and jitter injection and real-time multiplexing, gives you the ability to create and playout test sequences that fully stress and characterize design parameters. Using this display, you can easily configure and control the product in real-time testing applications, to quickly identify and diagnose problems with designs or to characterize design or system performance. The MTS300 Master Client application controls real-time testing operations and displays status information organized into three panels. Port Manager Panel. The Port Manager lets you configure and control the MTS300 I/O ports. You can assign an application server to these ports that either monitors or captures the transport stream present at the MTS300 input interface associated with the I/O port, or plays out a transport stream at the MTS300 output interface associated with the I/O port. Different icons represent the different ports and application services. For monitored transport streams, red icons let you immediate identify the transport stream experiencing problems. Services Panel. The Services panel displays the status of each program or service in the monitored transport stream selected in the Port Manager panel. Different icons represent different programs or services. The same red icon indicates a service experiencing problems. In both modes, intuitive icons represent error types: a clock for PCR and PTS/DTS timing errors, a speaker for errors in audio services and a video recorder for errors in video services. 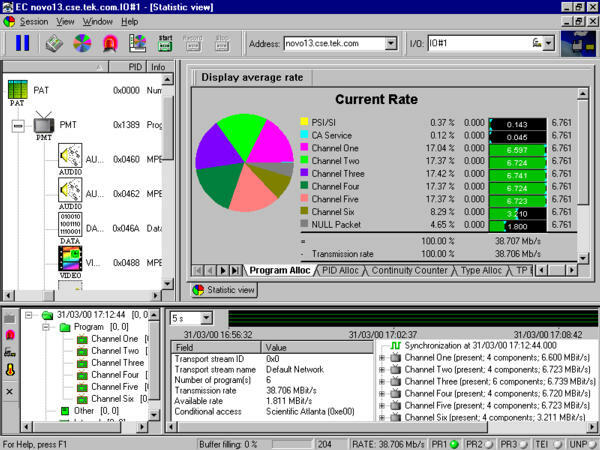 Figure 1 – Typical 3-panel Master Client screen. 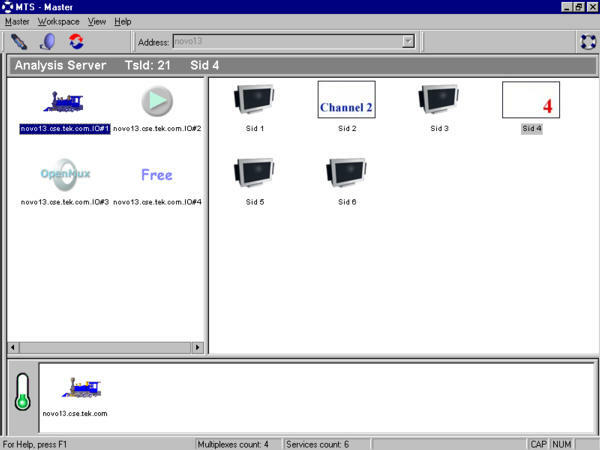 This screen displays the error status for the monitored MPEG transport stream and monitored services within the stream. To begin real-time analysis, you select a monitored transport stream or service in the Master Client and launch an MTS300 Expert Client. The Expert Client opens with a display of real-time analysis results on the transport stream. This tight integration lets you quickly detect problems with the Master Client, then open an Expert Client for more in-depth analysis. The Expert Client "status-at-a-glance" display (Figure 2) lets you quickly determine the overall bandwidth and efficiency of the transport stream under analysis. Dynamic graphic displays show data rates, percentage of use, and global data information on each program, PID, and the overall transport stream. The Hierarchy View displays the structure of the monitored transport stream, and the Report View displays analysis results. 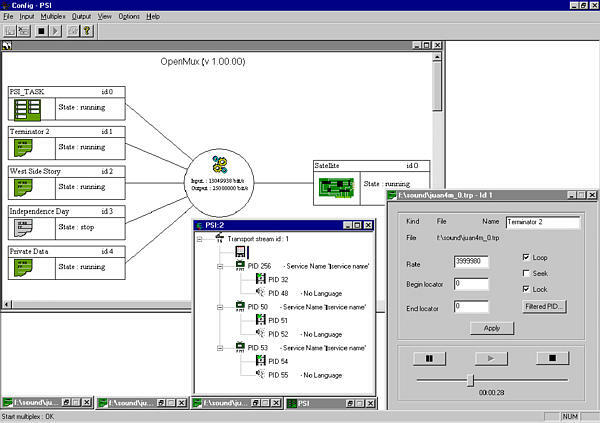 Figure 2 – Typical Expert Client screen. 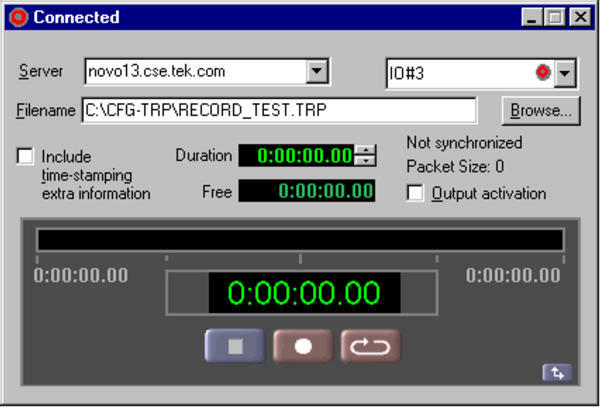 This screen displays information and analysis results of the monitored MPEG transport stream. The various views in the MTS300 use color to help you easily understand analysis results. Green indicates a passing condition for a particular analysis, red indicates a current failure and orange indicates a failure condition has occurred in the past, but is no longer present. You can view analysis results for the overall stream in the Report View or select a specific PID in the Hierarchy View and display analysis results on only this selected PID. You can also launch the MTS300 Configuration Client on a selected transport stream or service. The Configuration Client lets you tailor the real-time analysis to meet your specific needs. You can use default analysis criteria or vary analysis criteria from established values to test the limits of your design. For example, you can establish limits on the repetition rate for system information tables, establish timing relationships between table subsections, and set PCR jitter tolerances. Also, you can use the Configuration Client to control the logging and reporting of analysis results. You can specify errors as critical, major, minor, or warnings. You can limit some analysis, e.g. PCR timing, to look at only specific programs or PIDs. The Expert Client offers two views for displaying the results of TR 101 290 analysis. One view gives you a simple "red light/green light" display of the current status of all Priority #1, #2, and #3 parameters. A separate view gives you more detail on the evaluation results. 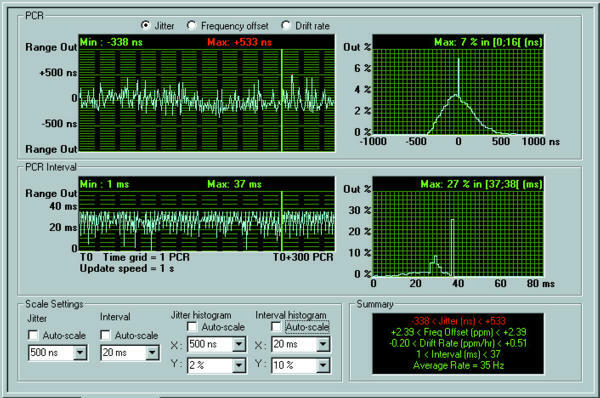 The MTS300 offers real-time display of PCR timing analysis (see Figure 3) using a precision oscillator that timestamps incoming PCR values, enabling Tektronix-exclusive measurements of PCR overall jitter, drift, and frequency offset. You can establish fault criteria based on MPEG, DVB, ATSC, or ISDB standards, or your own test parameters. The MTS300 will compare PCR timing measurements against these fault criteria, using red icons to indicate error conditions and logging errors with time of day and date information. You can display multiple PCR views simultaneously to assist in diagnosing timing problems in multiplexers or encoders. Figure 3 – PCR analysis. The PID Allocation view (see Figure 4) lets you view all PIDs associated with either PSI/SI/PSIP tables or program elements and monitor their data rates. You can set high and low limits for these data rates and the MTS300 will alert you when the data rate falls outside these limits. This capability is especially important when analyzing the output of a statistical multiplexer in order to identify problems with bandwidth usage. Figure 4 – PID allocation. The MTS300 offers support for developing products and systems for data broadcasting applications. The Expert Client performs IP monitoring with detailed views of ISO/IEC 13818-6 (DSM-CC) and EN 301 192 tables, syntactic analysis of these tables with error reporting, and the ability to monitor the data flow in IP sessions included in MPEG transport streams using Multi-protocol Encapsulation. Figure 5 shows multiple DSM-CC elements along with their IP traffic sessions. Figure 5 – IP data monitoring. Intermittent problems are difficult to detect and capture. The MTS300 addresses this problem by incorporating a triggered capture function (see Figure 6) that lets you specify an error or event to be monitored, start the process, and walk away. When the designated error or event occurs, the system automatically captures up to 128 MB of data that you can analyze at a later time. In addition, you can filter the capture to remove selected PIDs from the transport stream. You can also manually trigger a capture from the front panel. Figure 6 – Data storage/capture configuration. With data logging enabled, the MTS300 real-time analyzer will store status and error information on the hard disk in a tab-separated text file (see Figure 7). Using the Configuration Client, you can select the information stored in the log and the size of the log files. Log files close when they reach the specified size, but logging continues until the analysis stops, you disable logging, or the hard disk gets full. Figure 7 – Status and error log. You can monitor Mega-frame Initialization Packets (MIPs), specified in the DVB TS 101 191 standard, using either the real-time or deferred-time analysis capability of the MTS300. MIPs carry information about the type of transmission that will be used to broadcast the transport stream. It is used to synchronize and configure DVB-T transmitters (SFN adapters) using GPS-based time stamping. The Private Syntax Table Editor lets you describe the syntax of a private table. You can then use the table for testing the syntax of the incoming transport stream, validating private table information. If you are using the MTS300 Master Client in an operational network environment, you can take advantage of the SNMP agent included in the real-time analysis system to control the MTS300 or capture analysis results from a remote location. A collection of optional MTS300 software gives you powerful tools for analyzing MPEG-2 transport streams in detail and for creating your own custom streams to use in functional and stress testing. The MTS300 deferred-time analysis capability features four types of displays or views. You can perform any of the testing below, based on your specific measurement requirements. All of these tests can be performed either individually or grouped together for automatic execution. These parameters can be easily modified using the included DVB, ISDB or ATSC Table Editor or Jitter Adder programs. You can generate a "known good" transport stream to test performance of the entire system or an individual component under ideal conditions. Because you have control over the user-definable parameters, you can create a custom transport stream with variations to stress performance at or near operational limits. 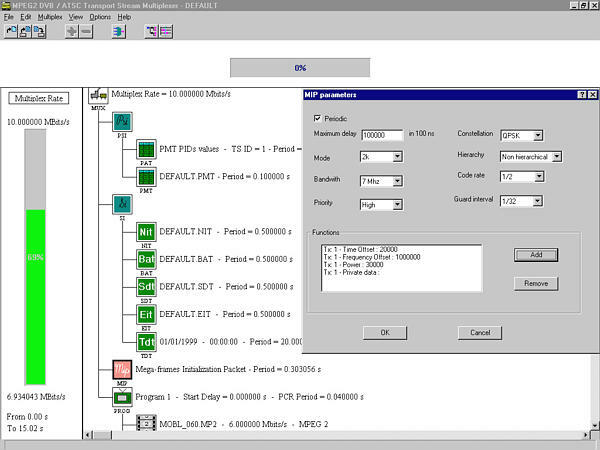 For example, Figure 8 and Figure 9 show custom transport stream creation. Figure 8 – Custom ATSC transport stream with PSIP tables, high-level MPEG-2 video, and Dolby AC-3 audio. 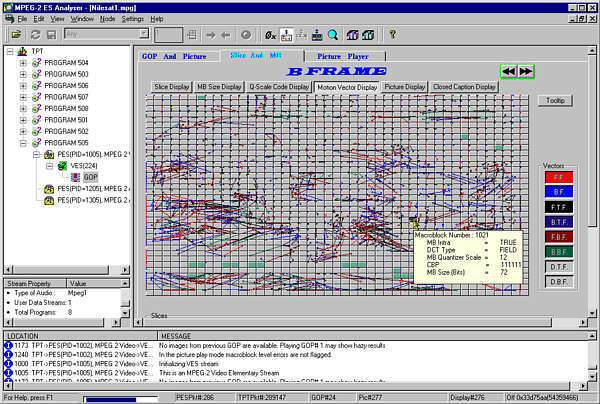 Figure 9 – Custom transport stream with Mega-frame. All MTS300 systems include CD-ROMs with elementary streams. The video elementary streams contain both motion sequences and traditional television test patterns. The multiplexer allows the user to collect together components from streams recorded off hard disk or CD/DVD-ROM, manipulate them in an unlimited manner and then rebuild a fully compliant output stream for whatever use is desired. Along the way, the system's in-built syntax knowledge of tables and descriptors ensure compliance and high quality output of the final multiplex transport stream. MTS300's off-line multiplexer accepts any recorded transport stream as an input source. 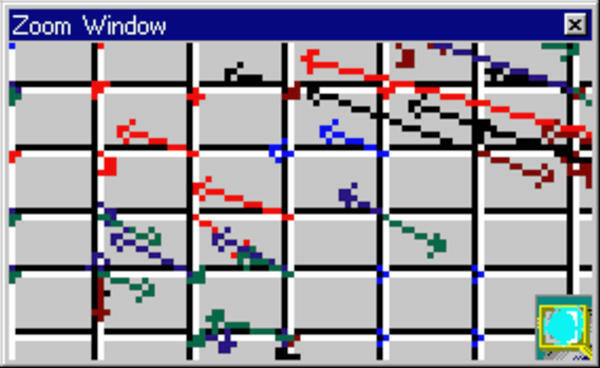 The user can then decompose this transport stream into its component PES. 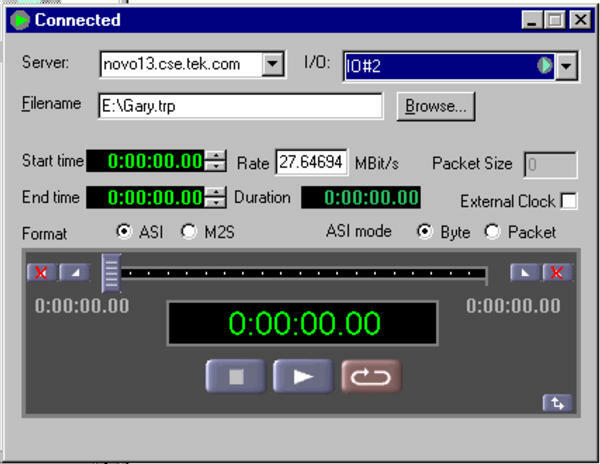 The user can then save resulting PES and ES streams onto disk. These PES or elementary video and audio streams can be grouped together into logical groups - "Programs" of video, audio and other associated data (private data, e.g., teletext). The original timing relationships are preserved. These streams and/or other pre-recorded PES or ES streams can then be reassembled together to build up a totally new transport stream as the user desires. Regrouping of elementary streams or programs can be achieved within an existing transport stream, by allowing the individual stream identifiers (PIDs) to be remapped as required. "Map, Check and Rebuild Your Own Multiplex "
These streams can then be rebuilt into a larger multiplex stream and new system information tables can be customized and added. 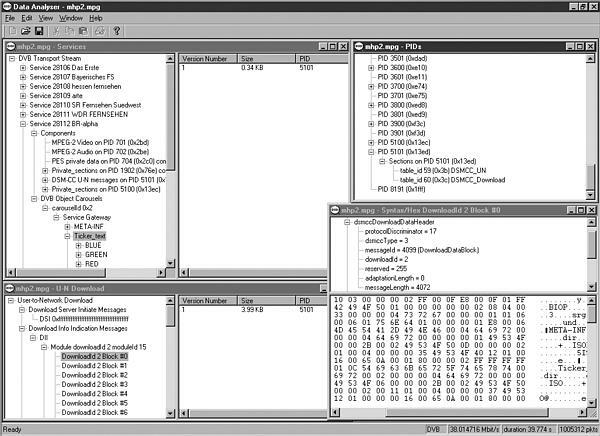 Powerful syntax auto-check warns the user of mis-mapped, reserved or duplicate PIDs, including the Program Paradigm, by checking and automatically updating PAT, PMT and derivable fields (in its "standard" mode) accordingly, to create a final legal and DVB or ATSC-compliant output stream. MTS300's multiplexer allows the user to be able to construct a transport stream for any rate equal to or greater than the sum of the individual components to be multiplexed. Another facility offered is the ability for the multiplexer to insert correct PCR values on the PIDs defined by the user. This allows for PCRs to be on a separate PID or embedded on an existing PID. The multiplexer is able to insert the PCRs at the correct repetition rate and also allows the user to specify the PCR repetition rate, if desired. "Create, Add or Modify SI Flexibility "
The multiplexer allows all of the standard MPEG/DVB/ATSC system information tables (SI) and descriptors to be edited. The user is permitted to generate illegal conditions that allow stress of decoder or transmission chain equipment to verify its robustness. It is also possible to generate private tables and descriptors. The software can be set to generate an optional warning when certain illegal conditions have been generated. This is visible clearly on the user interface. In a similar manner, the multiplexer allows all legal descriptors to be added to each table. The repetition rate for each table can be changed, overriding the default value. A conditional warning is generated if an illegal repetition rate is defined. Standard Mode will calculate related fields and table pointers (e.g., checksums) for the user without having to worry, but an Expert Mode is also provided to allow the user to set these to illegal conditions for test conditions as described above. 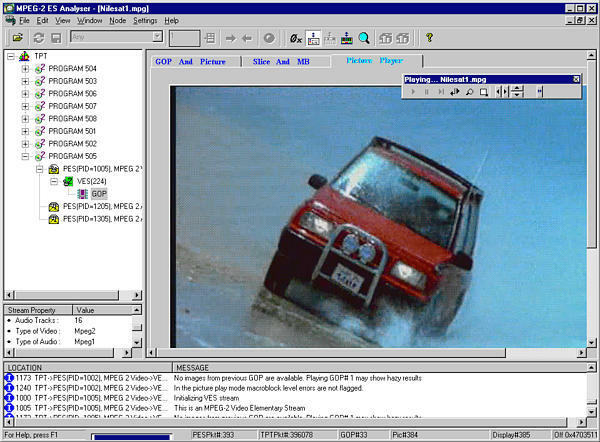 Figure 10 – MPEG video elementary stream analyzer. Both syntactic and semantic (coherence between all components in the stream) analyses are available. An extraction routine allows the user to select and save either the whole stream or a part of the stream. The MPEG Audio Stream Analyzer (see Figure 11) allows you to analyze and decode MPEG audio layer I and II specification streams at different levels. 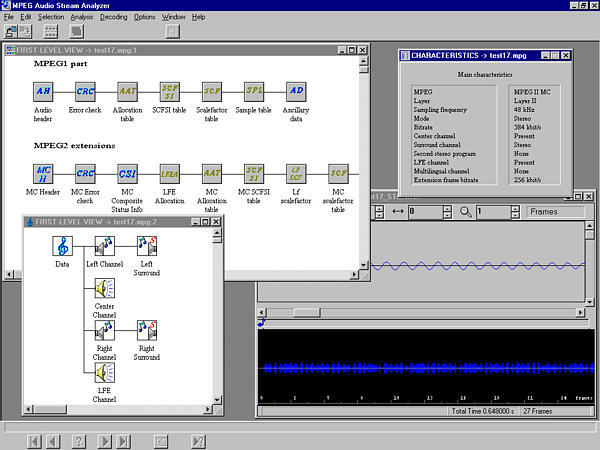 Figure 11 – MPEG audio elementary stream analyzer. The audio analyzer provides the following levels of analysis. At each of these levels, the software can perform syntactic, semantic and CRC analysis. An extraction routine lets you select and save either the whole stream or a part of the stream. You can save the decoded stream in a .WAV file format and play it back on the MTS300 internal speaker. This application brings to MTS300 not only the ability to actually view the moving picture from within a PES stream, but also to carry out a whole range of sophisticated new tests on the lower layers of an elementary stream within a transport multiplex. This gives added confidence when analyzing streams because encoder performance can be verified right down to slice and block layer together with motion vectors (see Figures 12 and 13). Figure 12 – Advanced ES Analyzer Motion Vector display. Figure 13 – Enlarged section showing Macroblocks and associated Motion Vectors using Zoom Window. The sequence header can be viewed along with the extensions. The picture rate, chroma format and the video type (NTSC, PAL, etc.) appear in the status bar when the sequence headers are displayed. 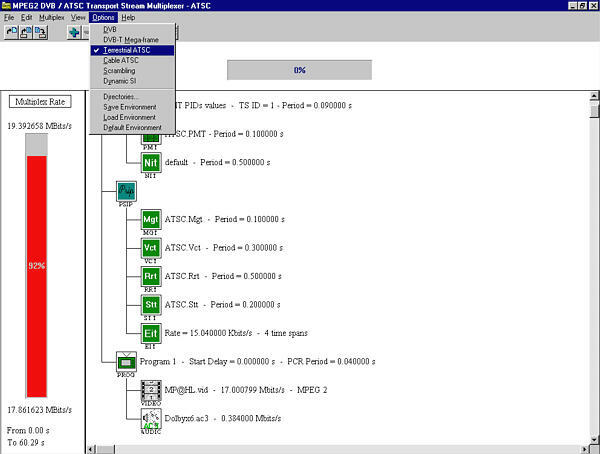 The stream can be run through with the option of analysis of the stream at picture level or at the macroblock level. When analyzing the group of pictures (GOP), it is possible to randomly access any picture from within the group, view the picture type, spectrum and display picture size plots. The user can zoom in on the picture to see details at the slice or macroblock levels or view the encoded picture. Picture player (see Figure 14) can be operated until degradation in quality is seen, the picture paused and the details reviewed down to the macroblock level. An easy mechanism is provided to switch between the picture display and the data analysis windows. 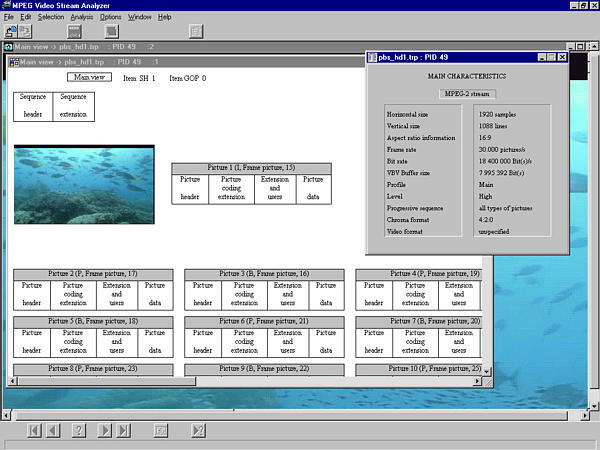 Figure 14 – Advanced ES Analyzer picture player. Macroblocks can be selected and detailed coding investigated. The picture analysis can be performed with special displays of quantizer scale distribution, slice size distribution, macroblock-size spectrum and motion vector plots. Quantizer matrices can be downloaded for any picture, at most four matrices, namely intra-quantizer matrix, non-intra-quantizer matrix, chroma intra-quantizer and chroma non-intra-quantizer matrix. The picture coding extension is always displayed, while the other picture extensions are displayed on tabbed folders; these are copyright extension, picture display extension (PDE), picture spatial scalable extension (PSSE) and picture temporal scalable extension (PTSE). The B and P frame motion vector displays allow you to select Macroblock Intra, pattern motion backward and forward together with macroblock quantization, quantizer scale DCT type and motion vector format. 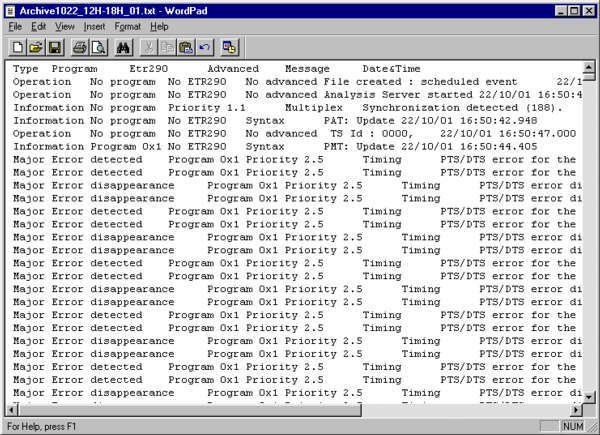 Comprehensive error logging is provided during stream analysis and selectable error filters are available. There is also an automated "regression" test mode that can save data from selected fields to report files for viewing later. The audio analysis capability includes navigation to any audio frame and viewing its details, header, frame data plots. Audio descriptors are interpreted and displayed in higher level streams and validated against the stream. In-depth off-line analysis of MPEG-2, DVB and ISDB Transport Streams containing DSMCC data broadcast protocols including IP, Data and Object Carousels lets you fully verify product, system design and performance. Figure 15 – Carousel Analyzer DDB analysis. Figure 16 – Carousel Analyzer DII analysis. Figure 17 – Carousel Analyzer Carousel Content Repetition Rate and Bit Rate view. Dolby Digital sound uses Dolby AC-3, a proprietary audio coding technique developed by Dolby Laboratories for efficiently storing and transmitting multiple channels of digital sound. This software analyzes Dolby AC-3 elementary streams, including elementary streams embedded in MPEG-2 transport streams, program streams, or packetized elementary streams (PES). Analysis functions include CRC checking, syntactic analysis, and semantic analysis. You can plot graphs for the following fields to observe trends in these values over different sections of the stream. 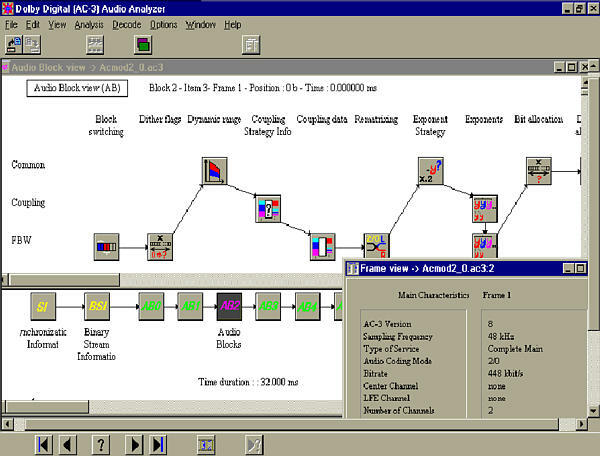 Figure 18 – Dolby AC-3 analyzer. The interpreted display shows the actual data along with each parameter field-name. Double-clicking the field-name produces a definition of that field as defined by the AC-3 standard. Figure 18 shows the Dolby AC-3 analysis application along with two characteristics views. You can save an AC-3 stream on a frame or time basis. You can also save the decoded AC-3 stream in a .WAV file format and play it back on the MTS300 internal speaker. 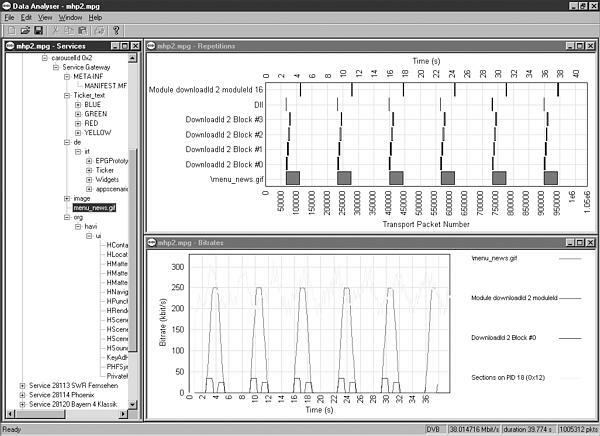 For designers developing products and systems for ISDB applications, this optional software lets you add TMCC data to an existing MPEG transport stream to test this aspect of ISDB transmission systems. Using a Windows "wizard" application (see Figure 19), you can easily create single- and multi-stream MPEG multiplexes for ISDB environments. 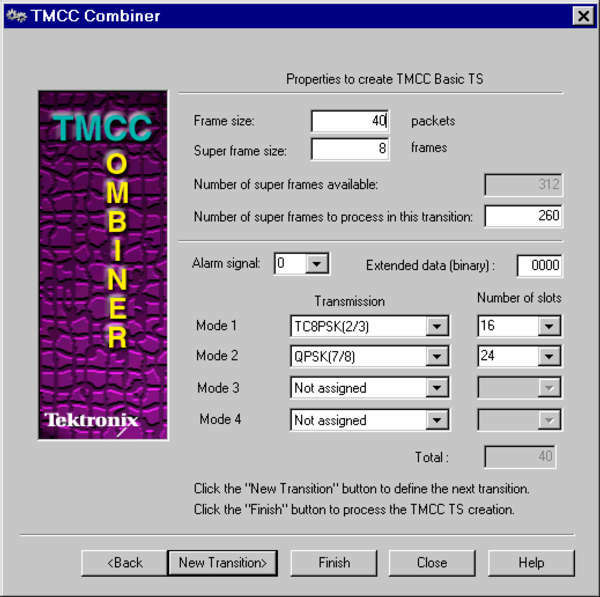 Figure 19 – TMCC combiner wizard. The MTS300 comes standard with easy-to-use transport stream record and playback capability. An optionally available real-time multiplexer lets you manipulate parameters of the generated stream in real time, giving you the power and flexibility needed to fully exercise product or system designs. The MTS300 Stream Recorder and Stream Player applications provide the capability to generate and to record transport streams using VTR-like controls. Figure 20 and Figure 21 show the Stream Recorder and Stream Player displays. Figure 20 – Stream recorder. Figure 21 – Stream player. You can use the rear-panel trigger input to initiate the Stream Recorder. The Stream Recorder can capture up to 27 GB of data, equivalent to 60 minutes of data running at 60 Mb/s. The exclusive OpenMux application (see Figure 22) offers an easy way to multiplex MPEG-2 transport streams in real time. The heart of the application is a transport packet multiplexer task that can quickly process many input streams and output a valid MPEG-2 stream. The input streams can represent a single-program transport stream (SPTS), multi-program transport streams (MPTS), elementary streams, private data, PSI tables, DVB or ISDB SI tables or ATSC PSIP tables. Figure 22 – Real-time multiplexer. You can install up to four (4) rear-panel I/O interface ports on the MTS300 for external acquisition and generation, choosing any of the following options: ASI (M2S), SPI (LVDS), SMPTE310M, and DHEI (GI-Digicypher). The modular architecture of the MTS300 supports future system upgrades. You can purchase the system with only the capabilities you need now and can purchase field upgrades later to expand the capability of your system as your needs change or as new tests and technologies emerge. The MTS300 uses the Windows NT operating system and runs on a high-performance platform for maximum flexibility and upgradeability. MPEG Monitoring, Analysis and Generation Characteristics - Supports MPEG-2, DVB, ATSC and ISDB protocols. Analyzes transport streams in real-time and reports problems with multiplex format, system information (PSI, SI, and PSIP) tables, and video, audio and data content. Options are available for deferred-time transport stream, MPEG video, MPEG audio, AC-3 audio, Data Broadcast and program stream analyzers. Captures and generates MPEG transport streams in multiple formats. Options are also available for transport stream creation and multiplexing. Maximum Data Rate, Real-time Analysis - 180 Mb/s. Maximum Data Rate, Stream Recorder or Stream Player Operating - 140 Mb/s. Minimum Data Rate, Stream Recorder or Stream Player Operating - 1 Mb/s. Maximum Aggregate Data Rate, Stream Recorder and Stream Player Operating - 140 Mb/s. Number of Input/Output Interfaces - Up to four input/output interfaces with each interface providing input, output, clock and trigger connectors. Available Interfaces - Asynchronous Serial Interface (ASI/M2S), Synchronous Parallel Interface (SPI/LVDS), SMPTE310M Synchronous Serial Interface, DHEI (GI-Digicypher). Stream Recorder Storage Capacity - 27 GB nominal. Printer port - IEEE P1284. SVGA - 15-Pin, High density, D-sub. Graphics - 1024x728, 32 K colors minimum. ASI/M2S (Option AS) - BNC, Maximum analysis data rate: 180 Mb/s. Maximum record/play-out data rate: 140 Mb/s. Input bit rate: 270 Mb/s ±100 ppm. Maximum analysis rate: 180 Mb/s. Maximum record rate: 140 Mb/s. Minimum record rate: 1 Mb/s. Return Loss: +17 dB minimum, 27 MHz to 270 MHz. Output Bit Rate: 270 Mb/s ±100 ppm. Format: Configurable as ASI Burst, ASI Packet or M2S. Maximum loopthrough output rate: Follows input rate. Maximum play-out rate: 140 Mb/s. Minimum play-out rate: 1 Mb/s. Rise and Fall Times: 1.2 ns maximum (20% to 80%). Termination: 50 Ω nominal resistive. SPI - LVDS Parallel (Option LV) - D25, Maximum analysis data rate: 180 Mb/s. Maximum record/play-out data rate: 140 Mb/s. Termination: 100 Ω resistive nominal, line-to-line. Timing Reference: Rising edge of clock. Clock-to-data Timing: Data must be stable ±5 ns of rising clock edge. Signal Common-mode Range (LVDS): 1.125 V to 1.375 V.
Frequency Range: 125 kHz to 17.5 MHz. SMPTE310M (Option SS) - D25, Data rates: 19 Mb/s and 38 Mb/s. Input Data Rate: 19,392,658.5 ±1,000 b/s or 38,785,307 ±2,000 b/s typ. Data format: Compliant with SMPTE310M. Signal DC offset: ±0.5 VDC, maximum. Termination: 75 Ω resistive nominal, line-to-line. Return Loss: -17 dB, 100 kHz to 77.6 MHz. Play-out: 19,392,658.5 ±1 ppm or 38,785,307 ±1 ppm typ. Signal overshoot: 10% of maximum signal amplitude. Output Impedance: 75 Ω resistive nominal, line-to-line. Frequencies: 19,392,658.5 ±1,000 b/s or 38,785,307 ±2,000 b/s typ. Connector: 26-Pin D, HD-22 Series. Termination: 120 Ω resistive nominal, line-to-line. Timing Reference: Falling edge of clock. Clock-to-data Timing: Data must be stable ±5 ns of falling clock edge. 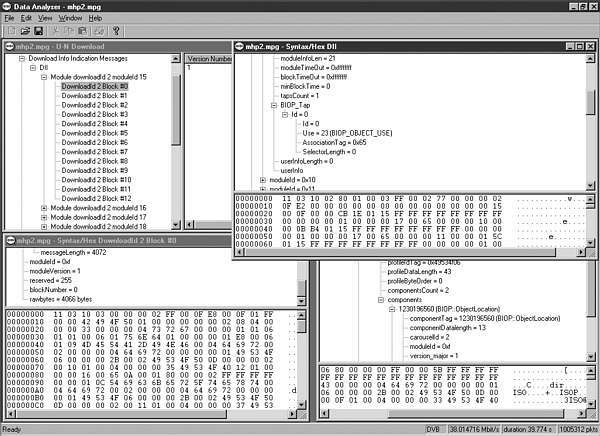 DHEI - GI-Digicypher (Option DE) - 26-Pin D, Maximum analysis data rate: 40 Mb/s. Maximum record/play-out data rate: 40 Mb/s. Operating System - Windows NT 4.0, (service pack 5). Character Input - Touch screen and keypad. Keyboard and Mouse - Standard. Source Voltage - 100 VAC to 240 VACRMS, 47 Hz to 63 Hz. Power Consumption - 170 W, typical. Safety Class - Class 1. Equipment Type - Test and measurement. Overvoltage Category - Category II. Pollution Degree - 2; rated for indoor use only. Low Voltage - Meets EN 61010-1:1993. EC Declaration of Conformity - Meets EN 55103-1/2:1996; Electromagnetic environment E4. Emissions - EN 55022, class A; EN 55103-1, Annexes A, B, and E; IEC 61000-3-2. Immunity - IEC 61000-4-2, -3, -4, -5, -6 and -11; EN 55103-2, Annex A.
Australia Declaration of Conformity - Meets AS/NZS 2064.